April is a wonderful month at The Children’s Center, with the weather improving, our children are able to get outside, run, and play. Today is also a good time to make a Birdies for Charity pledge. Remember to designate The Children’s Center as your charity of choice. Click here to donate. One of the children’s favorite visitors is Coach Chava who comes for soccer lessons. Each Friday morning for six weeks our four and five-year-old classes participate in soccer class. These sessions are not about scoring goals or making an assist, these lessons build gross motor skills and boost confidence. The skills developed are not just sports skills, but life skills. Coach Chava helps our children learn to follow directions, work cooperatively, be persistent and play safely. 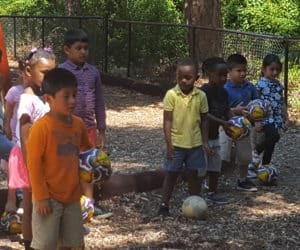 Children at this age are beginning to assert their independence and soccer can help children begin to learn conflict resolution skills. This is one of those programs that are available to our children because of the generosity of our community donors – your contributions don’t just teach A-B-C; they build life skills. You may have seen the articles in the Island Packet about home daycare centers in Beaufort County. It brings to the forefront the importance of doing your research as a parent when looking for a place to care for your child while working. The Children’s Center recognizes the awesome responsibility we carry when caring for children. In our continuing effort to ensure our children and staff are well protected, a donor, friend, and member of our Board has donated an AED (Automatic External Defibrillator) to our Center. We are grateful to Mr. and Mrs. Robert Eberly, Jr. for their vision to identify and fill this vital need. All our teaching and administrative staff are trained and certified in CPR and First Aid, including the use of an AED. We hope this new tool is never removed from its cabinet, but we are pleased that it is available if needed. As Hilton Head employers gear up for the busy summer season, many are concerned about finding enough employees to fill all their staffing needs. Employers surveyed reported that child care services decrease employee absences by 20-30 percent and reduce turnover by 37-60 percent. 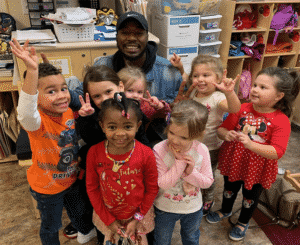 According to the Childcare Partnership Project, “Engaging Business Partners” report, 49 percent of employers reported that child care services helped boost employee productivity. The Children’s Center offers programs beginning at 6 weeks old so mothers can return to work. With a rolling enrollment and year-round programs, The Children’s Center stands ready to support the workforce on our island. 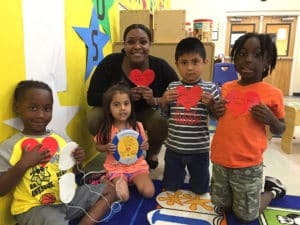 Summer programs for emerging kindergartners through grade two offer children programs for fun, friendship, and focus on eliminating learning loss in math and literacy.